I’ve been working out for a long time. I’ve been a trainer/coach for a long time. I’ve coached and personally performed 10’s of thousands of squats, presses and pulls. And I’ve seen great results as far as strength increases and body transformation both in myself and my clients alike. But, like I’ve mentioned in my article “Try a Little Less,” there are only so many biceps curls and chest presses that one can perform in their life before just the thought of doing another one becomes almost unbearable. Workouts like this can soon become an OBLIGATION, not a time of personal fulfillment like it should be. That’s not a place you want to be. This is when many workout plans die. So, I started doing something about this inevitable motivation mud pit. 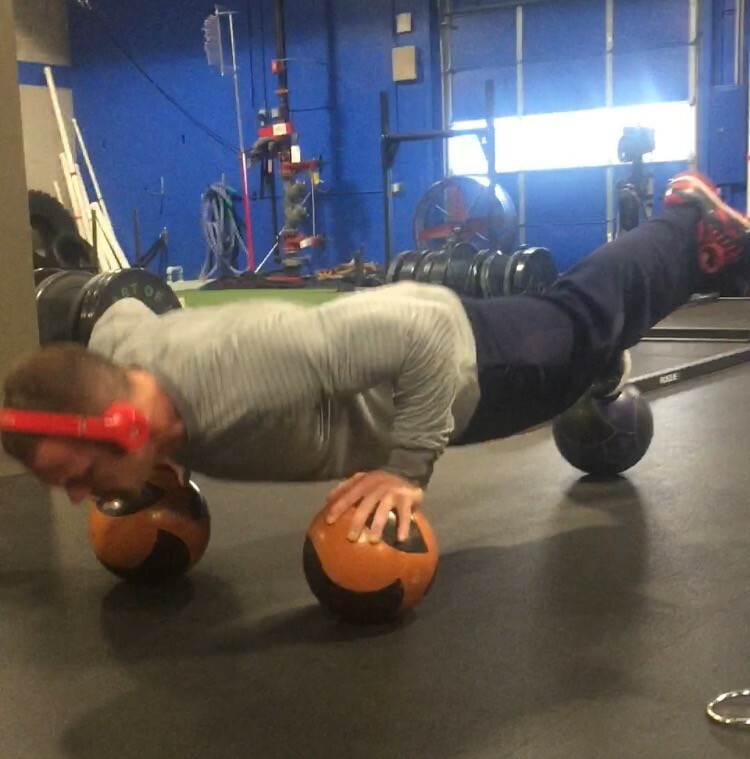 The 3 med ball push up for reps was a “feat” I choose to add to my workout. The Feats are a list of mostly arbitrary feats of strength that I want to be able to do (or get better at). They don’t have to be “functional” or useable in my real life in any way other than they make me happy when I can do them or get better at them. And that happiness and sense of accomplishment in your workout can take you a long way in staying motivated to do all the OTHER things you need to be doing to stay healthy. I do the same with my clients. I ask them to tell me some physical feats they would like to accomplish that may have nothing to do with the main reason they are working out. And then we work on them systematically until they achieve what they set out to do. Its a lot of fun, and gives another sense of purpose to the challenging weekly workouts. I highly recommend, if you’ve arrived at the inevitable workout-burnout stage, to add a “Feat” or two into your weekly workout program. It’s a great way to breathe life into a stale, repetitive workout routine. This is not an exhaustive list, but it’s a good start. Just pick one or two to work on at a time. Something to keep in mind, feats don’t have to be so circus-tricky. Just pick a lift, or movement pattern, or running time, etcetera that you want to improve. Work on that one thing specifically once or twice a week.